Those are the same vaccines that are mandated to children in the US, and many other countries. No pharmaceutical drug is devoid of risks from adverse reactions and vaccines are no exception. According to the world’s leading drug regulatory authority, the US Food and Drug Administration (FDA), vaccines represent a special category of drugs in that they are generally given to healthy individuals and often to prevent a disease to which an individual may never be exposed. This, according to the FDA, places extra emphasis on vaccine safety. with regards to vaccination should be given by the parents. As a result of such vaccination policy promoted by the JCVI and the DH, many children have been vaccinated without their parents being disclosed the critical information about demonstrated risks of serious adverse reactions, one that the JCVI appeared to have been fully aware of. It would also appear that, by withholding this information, the JCVI/DH neglected the right of individuals to make an informed consent concerning vaccination. By doing so, the JCVI/DH may have violated not only International Guidelines for Medical Ethics (i.e., Helsinki Declaration and the International Code of Medical Ethics) but also, their own Code of Practice. The transcripts of the JCVI meetings also show that some of the Committee members had extensive ties to pharmaceutical companies and that the JCVI frequently co-operated with vaccine manufacturers on strategies aimed at boosting vaccine uptake. Some of the meetings at which such controversial items were discussed were not intended to be publicly available, as the transcripts were only released later, through the Freedom of Information Act (FOI). These particular meetings are denoted in the transcripts as “commercial in confidence”, and reveal a clear and disturbing lack of transparency, as some of the information was removed from the text (i.e., the names of the participants) prior to transcript release under the FOI section at the JCVI website (for example, JCVI CSM/DH (Committee on the Safety of Medicines/Department of Health) Joint Committee on Adverse Reactions Minutes 1986-1992. Dr. Tomlijenovic explains; for instance, how JCVI has known since as early as 1981 that the measles vaccine, which is part of the government’s official vaccine schedule, is linked to long-term neurological damage and death. She also outlines, with full citations, evidence showing that JCVI has long been aware that many of scheduled vaccines cause permanent brain damage in children, but have continued to promote those vaccines anyway. A Freedom of Information Act filing in the US with the CDC by a doctor with an autistic son, seeking information on what the CDC knows about the dangers of vaccines, had by law to be responded to in 20 days. Nearly 7 years later, the doctor went to court and the CDC argued it does not have to turn over documents. A judge ordered the CDC to turn over the documents on September 30th, 2011. The US CDC is an unreliable source of information. They constantly grossly exaggerate death and disease figures to promote vaccines. The UK Department of Health does the same. Both for example have claimed flu causes thousands of deaths each year but in fact it does not. They do that to promote the flu vaccine, which the international Cochrane Collaboration, which publishes medical research into the accuracy of claims like that, has shown that the flu vaccine is not effective. Vaccines contain a combination of at least 39 different highly toxic metals, cancer causing substances, toxic chemicals, live and genetically modified viruses, bacteria, contaminated serum containing animal viruses and foreign genetic material, extremely toxic de-contaminants and adjuvants, untested antibiotics, none of which can be injected without causing any harm. 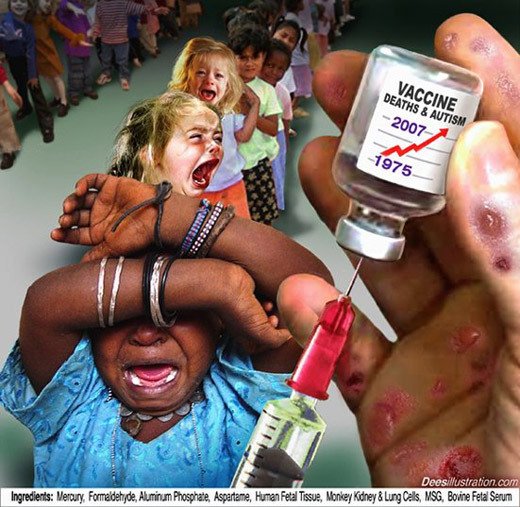 Vaccine contaminants have included bovine (cow), avian (chicken) and monkey viruses and bacteria such as streptococcus in the DTP (diphtheria, tetanus and pertussis) vaccine [Pediatrics, Vol. 75, No. 2, Feb 1985] and Serratia marcesens in the influenza vaccines [2004 influenza season]. There is no scientific study to determine whether vaccines have really prevented diseases. Rather disease graphs show vaccines have been introduced at the end of epidemics when the disease was already in its last stages. In case of Small Pox the vaccine actually caused a great spurt in the incidence of disease before public outcry led to its withdrawal. There are no long-term studies on vaccine safety. Very short-term tests are carried out where the vaccinated subjects are checked against another group who are given another vaccine. Technically the tests should be carried out against a non-vaccinated group. No one really knows what protocols are followed at such industry based or industry sponsored trials. The mercury, aluminum and live viruses in vaccines may be behind the huge epidemic of autism (1 in 110 in the USA), a fact that has been admitted by the US Vaccine Court. About 83 suspected cases of vaccines causing autism have been awarded compensation. Both the Small Pox and the Oral Polio Vaccine are made from monkey serum. This serum has helped many monkey viruses to enter the human blood stream. Out of these, the only researched virus, SV 40, has been found to be cancerous. These viruses continue to be in the vaccines. The presence of SV 40 in various human cancers has been demonstrated. Today it is known that the virus is being passed on to future generations as its presence in the mother’s milk and human sperms has been established. The number of polio cases was declining before the widespread administration of the Salk vaccine. Cases which had previously been reported as polio are now reported as meningitis. The risk of contracting polio from the live virus vaccine is greater than the risk of acquiring the disease from naturally occurring viruses. Many doctors argue that diseases during childhood are due to the body exercising its immune system. Suppressing these diseases causes the immune system to remain undeveloped causing the various autoimmune disorders in adults like diabetes and arthritis that have become epidemics today. Vaccines suppress the natural immunity and the body does not have natural antibodies anymore. The mother’s milk therefore does not contain natural antibodies and can no longer protect the child against illnesses. In the USA vaccine adverse effects are recorded and the Government offers compensation of millions of dollars to victims (the most recent case in its Vaccine Court may have received upto $200 million in damages). The courts in the USA have paid nearly $ 2 billion in damages so far. Vaccines try to create humoral (blood related immunity) whereas it has been found that immunity is developed at various levels: humoral, cellular, and organ specific. We still do not know enough about the human immune system and therefore should not interfere with it. In addition to childhood vaccination, new “hypes” like the Swine Flu, Bird Flu, Gardasil for HPV virus and the annual flu vaccine are continuing the to damage people’s health all throughout their life. Yves Thomas, the head of the National Influenza Centre in Geneva said that, “The debate and the arguments that surrounded the A(H1N1) influenza virus two years ago have sharpened public mistrust toward the seasonal flu vaccine.” In 2010, the World Health Organisation (WHO) was accused of dramatizing worldwide influenza cases in order to result in much higher vaccine sales since many countries had signed contracts with a stipulation to automatically buy vaccines when the WHO gave the highest alert level. Don’t let yourself intimidated by medical doctors, they are NOT Gods and they surely are misinformed, many of them are corrupted or don’t want to acknowledge the dangers of vaccines. Most schools will offer you a waiver if you ask for one. There is NO law that can deny you that. Exemptions are typically for people who have compromised immune systems, allergies to the components used in vaccinations, or strongly held objections. All states but West Virginia and Mississippi allow religious exemptions, and twenty states allow parents to cite personal or philosophical objections. Get yourself educated on the matter, it’s about the life of your child! 1. What are the serious negative health effects that these vaccines can generate? Are the risks worth the benefits? 2. Dr. Michel Odent has linked asthma to the whooping cough vaccine. Have you read his research? What do you think? 3. Professor Wakefield (UK) has linked autism and Chrones disease to the measles, mumps and rubella (MMR) vaccine. What do you think? What evidence do you have to back up your opinions? 4. Why is the same dose of vaccines given to a two month old as for a 5 year old? 5. Are you aware that Japan changed the start time for vaccinating from 3 months to two years and straight away their SIDS rate plummeted? 6. Do you believe in herd immunity? If so, how is it that 98% of U.S.A. children are vaccinated yet they still have outbreaks of these diseases? 7. Most diseases were already 90% gone before any vaccines were introduced. If this is so, how can vaccines be applauded for diseases ceasing, especially when there were no vaccines for some diseases like bubonic plague and scarlet fever? 8. How can the Tetanus vaccine induce immunity, when contracting the disease naturally does not give immunity? 9. If the so-called diphtheria vaccine, which is in fact a toxoid, works against the toxin produced by the bacteria, and not against the bacteria itself, then how did this “vaccine” help in the decline in diphtheria? To read and download the full 45 page report and its evidence by Dr. Lucija Tomljenovic, PhD see the link below. Read & Download Full Report.